The rise of streaming services is providing more space for women in the director’s chair, according to a new Morning Consult analysis. 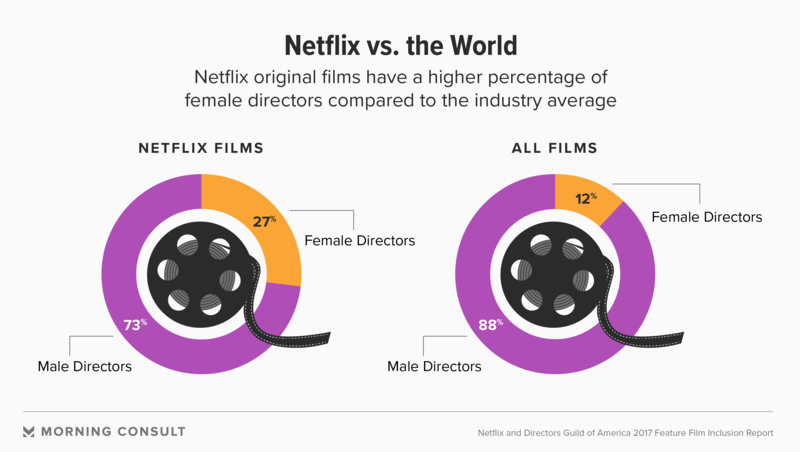 Twenty-seven percent of the directors of Netflix Inc.’s original films are women, out of 200 original films released or in the pipeline since 2013, the analysis found. While that percentage is lower than the share of U.S. women — just over half, according to the Census Bureau — it’s higher than the industry average. Twelve percent of directors who released films last year were women, according to the Directors Guild of America. And that number drops to 4 percent when accounting for the 1,000 top-grossing films released between 2007 and 2016, according to an analysis last year by the University of Southern California’s Annenberg School for Communication and Journalism. Amy Adrion, the director and producer of “Half the Picture,” a documentary about the low number of women directors in Hollywood, said it’s hard for any director to raise money, but women face additional hurdles. “The particular challenges for women lie in the fundamental fact that women’s work and women’s voices are less valued than men’s in our society as a whole in all realms,” she said in an interview last month. Because of this, women-led and -directed films tend to be considered more niche, Adion said, despite the fact that women make up half of moviegoers, per the Motion Picture Association of America’s 2017 theatrical and home entertainment market environment report. With Netflix’s seemingly unlimited bank account, executives are able to take on more of these so-called niche films without constantly worrying about their bottom lines, Adrion and other experts said. Netflix said it plans to spend up to $8 billion on new content this year, and chief content officer Ted Sarandos says 85 percent of that will go toward original content, per Variety. (The Economist projects it’s already outspent that total and will hit $12 to $13 billion in original and licensed content by the end of the year.) That dwarfs the $5 billion on original and licensed content from Amazon.com Inc. this year, according to Reuters, and the $1 billion from Apple this year, according to the Wall Street Journal. 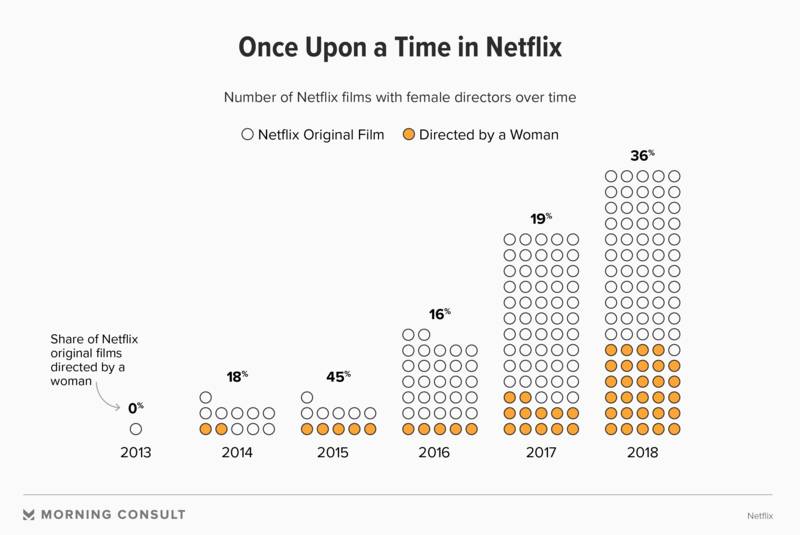 Netflix has upped its percentage of female directors of features over time. Netflix had zero female directors in 2013, but that number has increased to 36 percent for films released or in the pipeline this year. 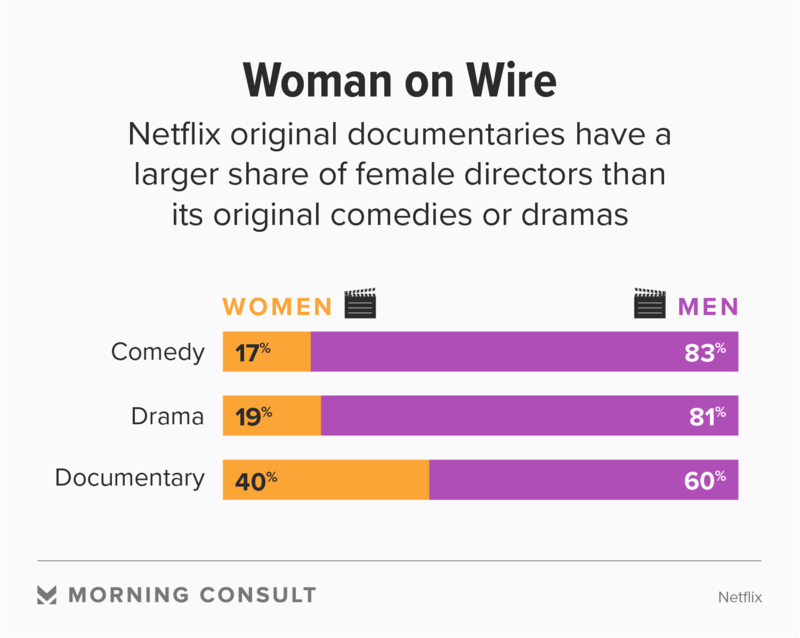 When taking documentaries into account, female directors made up 40 percent of Netflix’s original films over time. Documentaries generally have lower budgets, so female directors or others who may have trouble securing money often find it easier to make documentaries, Adrion said. Ian Bricke, co-head of Netflix’s independent film division, in an interview said diversity in the director’s chair is intentional only in the sense that Netflix is a service trying to appeal to diverse audiences. “We’re proud of what we’ve been able to do, and we can do better,” he said of director diversity. Bricke said Netflix is able to take more risks than traditional film studios on films that wouldn’t necessarily be blockbusters. Newman said it’s possible her film, which tells the story of a young black female wrestler reconnecting with her estranged father, wouldn’t have been made if it hadn’t been picked up by Netflix. “The way people are consuming films is evolving and changing,” she said in an interview last month. Newman said streaming allows for the production of films that wouldn’t necessarily be considered blockbusters, with people shelling out $15 per ticket. Netflix is in many ways creating a path for female and minority directors by featuring their work, she said. More mainstream studios may follow suit. Newman is also part of NBC’s Female Forward inaugural class, which provides a pipeline for female directors to get into scripted television. Twenty-one percent of scripted television episodes were directed by women in the 2016-2017 season, according to the Directors Guild of America. Inclusion riders, or contract clauses mandating that a certain percentage of film crew be women or underrepresented minorities, have been introduced as a solution to the industry’s diversity problem. But these riders do nothing to address the paucity of women in more leadership roles, including as directors. Myriam Aziza, the director of Netflix’s French language film “To Each, Her Own,” said it’s clear how her gender impacts her career when she compares herself to her male peers. “It’s like I have to prove myself every time, as if every movie was the first,” the director of eight films said in an email to Morning Consult. Echoing Newman’s experience, Aziza said Netflix helped with financing when no one else would. But Aziza expressed some frustration that Netflix did not promote her film as much as she would have liked, especially in her home country of France. The film was mentioned in a New York Times article on the streaming service’s international film repertoire.